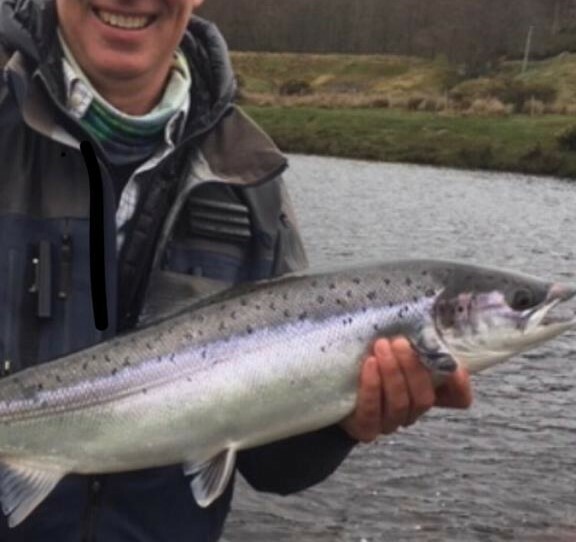 The Carron has had another strong start to the year and with the river fining down after an enormous spate we are expecting further good fishing for the next week and, if the weather is kind, the months ahead. March highlights include 11 fish in a week to one 4 rods party and, on another beat, 8 to 2 rods. Great March fishing. The river has options to suit all preferences and it is superb value. Cornhill and Gledfield are 2 rods beats available from £465 per week (the equivalent of £40 per rod per day). Gledfield has a riverbank cottage that is also available to let if required. At Dounie you can take either 2 or 4 rods for a week, again there is a riverbank cottage available and again from £465 per week for 2 rods, and at Glencalvie you can a take a week of the utmost luxury with 2 rods on the Glencalvie beat with a further 4 on the Gruinards beat. We have had a recent cancellation on Glencalvie and we can offer a May week at a very attractive rate. POA. The pictured fish was caught in the w/c 25th March at Gruinards. Well done Ruaraidh.